At times the corruption and pollution in our world feels like it leaves us tainted or stained simply because it is all around us. Like mud on a rainy day, we cannot avoid it. We cannot open a newspaper or turn on the internet without seeing reports of filth, degradation, perversion, and wanton sin paraded before us. Just being exposed to it makes one feel unclean. Thank God that Jesus’ blood cleanses us of all iniquity and unrighteousness. Thank God that Jesus shed His blood that we might “escape the corruption in the world” that threatens to consume us. Praise Him for his divine power and His promises that we can be free, free in Christ, filled with the Holy Spirit. Thank God that He sent His incorruptible Son. May the Lord of Glory place a hedge of protection around you, and bless you and keep you. Often our lives seem to move at a hectic pace and the demands on our time and for our attention are constant; we can barely get the things done that need to get done or attend to those that need us. If we get a moment or two somehow the world intrudes to disrupt us and another call disturbs our rest. Though called to serve, serving can weary us. Let us remember the One who called us; let us remember the One from whom our strength comes. 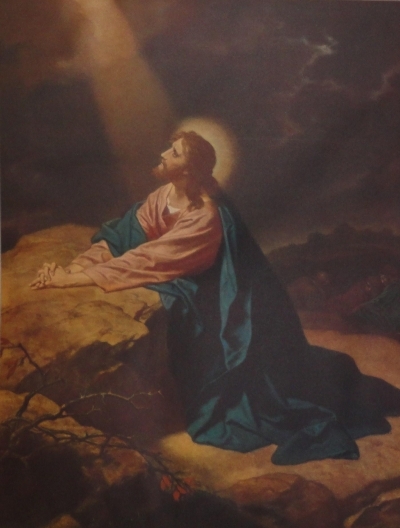 Jesus knew and He would withdraw to quiet places alone to pray, to be with the Father, and to renew His strength. Let us remember to do likewise. May the Lord bless you and refresh you as you spent time alone with Him. Blessing follows belief, for the Lord pours out His blessings on those who believe in Him and trust in His holy name. In every situation the Lord is our hope and our salvation. Call on His name and He will answer; pray and He will hear; seek Him first and He will provide for every need. Never does the Lord leave His children forsaken; those who trust in Him shall not want; though hardship or trouble arise all around us, He never leaves us as orphans, for we are the children of the King of Glory, and our hope, our confidence, is in Him who gave Himself for us. Praise be to the Lord Almighty and to Jesus Christ His son and to the Holy Spirit, the spirit of God. Thank you, Lord. May the Lord pour out His blessings and mercies upon you as you trust in Him. Each day has troubles and challenges of its own, Jesus reminded us, and it is all too easy to be in turmoil trying to deal with the situations and problems that keep peace from our door. Yet the Lord tells us that we should not dwell on problems and challenges, but we should keep our minds on Him, we should place all of our trust in Him no matter what is happening in the world or in our own lives, for only in Him, and in Him alone, is there peace. We must allow our heart to trust Him and our mind to be steadfast, for He who loves us and gave Himself for us is He who is able, who is for us, who is forever, eternal, who can make a way when there is no way, our Lord, our Savior, our Deliverer. Praise His Holy Name. May your heart and mind remain steadfast because you are trusting in the Lord. You are currently browsing the An Encouraging Word blog archives for July, 2011.